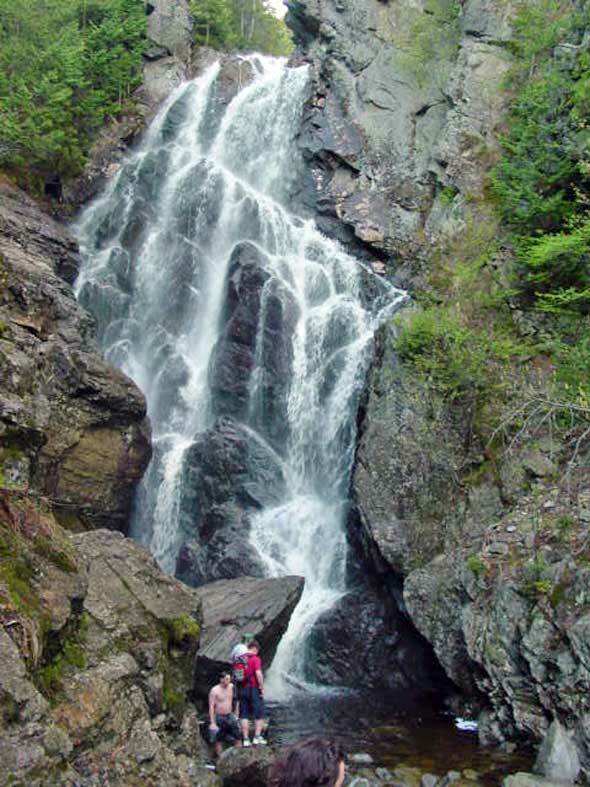 Angel Falls, in the Rangeley Lakes Region is one of Maine’s highest waterfalls. ANGEL FALLS: An exceptionally scenic “hanging” falls with the longest single drop (90 feet) in Maine. Located 17.6 miles south of the village of Oquossoc. Go west on Route 17, cross bridge, then go right onto the old railroad line (Bemis Track). From here the trailhead is 11.9 miles on the right. Turn right at the sign, and follow the gravel road past a small pit. Follow the red-blazed marked trail, approximately 1 mile from this point. The trail crosses streams five times, which can become obscure and dangerous at times of high water, so please check for current conditions.